Those experienced in California’s boom and bust budget cycles are getting dizzy. As the Governor prepares an updated budget proposal, the expanding recovery is pushing state revenues ever higher—perhaps $4 billion over this year’s budget. For many, this inspires euphoric speculation about how the money could be spent. But if history is any guide—and it is—the endorphins won’t last. For sure, there is no shortage of worthy public programs. But the long-term viability of those programs will be influenced by how well lawmakers incorporate into next year’s budget the lessons learned over the last 15 years—and how smart they can be about the next 15 years. Drawing from its Financing the Future analysis, CA Fwd believes the following four budget insights could minimize regrets and strengthen public programs no matter what the future holds. 1. This is a boom, and it should be treated as a boom. Even if it is not, it should be treated as a boom. California’s regional economies are finally outperforming the nation. Jobs (if not salaries) are growing faster than any other state, and the recovery is slowly spreading inland. But the average time between the last five recessions was 68 months. May 2015 is the 71st month of economic growth. And for the same reason state revenues are surging—a high dependence on personal incomes taxes on the wealthiest Californians—those revenues will drop when the economy slows. Remember 2005? Remember 1999? Tax revenues poured in after Tax Day in those years—billions more than expected. Both times, lawmakers spent the money as if it were a “new normal.” In 2000, K-12 schools received a $6 billion baseline increase, and lawmakers cut the car tax—twice. In 2005, schools and social services received a $10 billion boost, and lawmakers opted not to pay off the budget debt from the previous recession. Within a year of these spending sprees, recessions hit. With more obligations than money, the state cut deep into programs for vulnerable Californians. Billions were borrowed; credit ratings went down and borrowing costs up. California made international headlines for its fiscal profligacy. This dynamic will be even stronger in this cycle because of the temporary income tax hike on wealthy Californians approved by voters in 2012. Proposition 30, which is responsible for $8 billion of the $113 billion in the General Fund, was helpful in stabilizing spending for schools and safety net programs. But this temporary tax, made necessary by past fiscal irresponsibility, also accentuated volatility, as reflected in the revenue bump. Beginning next year the provisions phase out—taking billions off the table. And don’t forget 1978, when a state surplus and inflation-fueled property taxes persuaded Californians they were overtaxed—and were offered only one solution: Proposition 13, which unintentionally triggered decades of conflict between the state and local government. 2. Budget rules will drive where much of the extra money goes—but not how it will be spent. According to the Legislative Analyst’s Office, the Prop. 98 school funding guarantee will sweep up the first $4.4 billion of this year’s revenue growth, and as much as 40 cents of every dollar above that. But Prop. 98 does not dictate how that money is spent on K-14 education. Some one-time investments—in facilities, technologies and paying down retirement obligations, for example—could provide benefits now and reduce long-term costs so school districts can avoid cuts to operating budgets in the next recession. While it might be up to 1,000 school districts to decide how to spend that money, the state could provide incentives for schools to make one-time investments—such as professional development—that could improve educational outcomes and reduce the need for future pink slips. A second constraint this year will be Prop. 2, the reserve requirement approved last year by voters appropriately weary of this fiscal roller coaster. By year’s end, the reserve will likely hold $4 billion or more. The danger is lawmakers may assume the reserve will protect programs from future recessions. That is only partially true. How lawmakers spend the balance of the money will have as much to do with how deep they will have to cut into safety net programs when unemployment increases. 3. Spend growing revenues on reducing growing cost drivers. The Governor and the Legislature have done an admirable job of reducing budgetary debt they inherited from their predecessors. But to preserve programs going forward, elected officials must also address the long-term liabilities and prepare for demographic and other fiscal inevitabilities. Some of those long-term pressures are already here. For example, four million Californians have enrolled in the state’s Medicaid program in the last two years as a result of the Affordable Care Act—pushing total enrollment past 12 million this year. While California’s share of this spending is largely covered by the federal government this year, state costs are expected to climb as much as $1 billion in the next four years as the federal share declines. The state also has started chipping away at its long-term pension and health care obligations—including a $74 billion unfunded liability in the teachers’ retirement system. 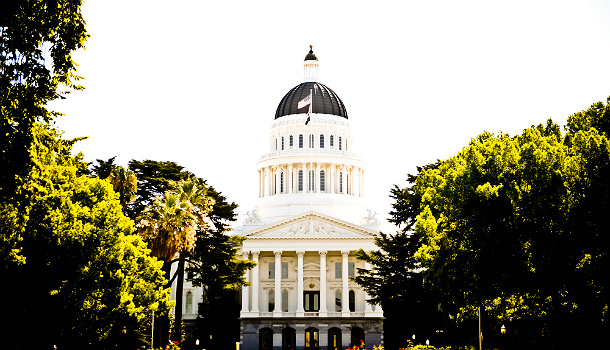 In 2006, the budget set aside $6.7 billion for all of the state’s retirement and health care plans—including CalSTRS, CalPERS, pensions for judges and other state officials. The January budget sets aside just under $12 billion. While the state’s contributions have nearly doubled in the last decade, the budget itself has grown by only 25 percent. Long-term obligations will take bigger and bigger bites out of the budget. How can lawmakers use some of this year’s surplus to protect critical programs from future cuts imposed by the existing commitments? 4. Spend unexpected revenues in ways that will make money in lean times. In hindsight, many of California’s biggest fiscal challenges are the consequences of poor decisions made in the best of times. In most cases, the politics of the moment overwhelmed any fiscal caution— significant increases in pension benefits, reduced taxes, expanded entitlement programs. But elected officials could flip that dynamic. Prop. 2 will capture some money for the reserve and pay off debt to make budget balancing easier in the future. Paying off other long-term obligations will reduce pressure on future budgets. But it is possible to spend some of the balance in ways that could increase employment, and thus revenue and resiliency, in the future. For example, investments in the right public infrastructure, matched with private funds, could encourage economic growth, increase public revenues, and decrease demand for public services. The state’s Infrastructure Bank could serve as a conduit for developing these strategies and partnerships. Lawmakers could set up true innovation funds for community and regional programs that are rethinking how to reduce high school dropouts, chronic unemployment, poverty, crime and drug abuse—problems that impose unbearable costs on public budgets and entire communities. Lawmakers also could use some of the resources to transition to a different revenue structure, which could support investments in infrastructure and workforce, encourage business investment and job creation and result in more reliable and growing revenue streams. These kinds of creative approaches will require some time to think through and get right. The Governor and the Legislature should not let the constitutional budget deadline force them into missing an opportunity to mature one or more smart investment opportunities that will pay dividends to Californians, their communities and the government. They could park some of the surplus until the plan is ready. Over the next six weeks, lawmakers will be deciding how to spend one year’s worth of state funds. But each year, California either moves closer to or farther from a more sustainable and equitable future. CA Fwd is doing its part by encouraging Californians to think bigger and smarter in its series Financing the Future: Where California needs to invest—and how to pay for it. Just think: Fifteen years from now the story could be how California turned a boom into the new normal. Lenny Mendonca is Co-Chair of California Forward and former director of McKinsey & Company. Pete Weber is a member of the California Forward Leadership Council and former Executive Committee Chair of the California Partnership for the San Joaquin Valley. CORRECTION: An earlier version of this blog mistakenly stated that the state is currently spending $1 billion for a subgroup of Medi-Cal recipients during the initial implementation the Affordable Care Act. Instead, net costs are expected to rise in four years for that group to an annual $1 billion payment as federal payments decline. Read the rest of "Boom, Bust, Repeat?"